The health and appearance of your child’s smile are important to you, which is why you encourage the right oral hygiene habits at home. Although brushing and flossing are vital, they are only half of the care your child needs. They must also see a dentist to set the foundation for lifelong oral health. 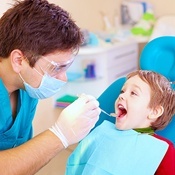 At Dental Innovations, we provide children’s dentistry in Montgomeryville to give your child the comprehensive, compassionate services they deserve. Although the primary teeth eventually fall out, they serve an important purpose. They allow your child to learn how to speak and chew correctly. They also act as placeholders for the permanent teeth. To ensure they stay strong and healthy, it is best to schedule an appointment for a cleaning and checkup before their first birthday and maintain their preventive visits every 6 months. What to expect during my child's 1st visit? During their first visit, our friendly dental team works to make your child feel at ease, so they enjoy their time in our office. Depending on their age, we make take a digital x-ray to see their developing teeth and oral structures. Special dental instruments are used to gently clean their teeth, and we discuss their brushing and flossing habits. Their dentist performs a comprehensive checkup to look for any areas of concern, like tooth decay. We discuss our findings with you and address any concerns you have, like thumb-sucking. Based on the results of their examination, we create a customized treatment plan to foster the health and development of their smile. 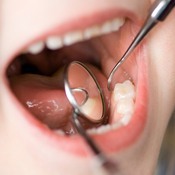 Dental sealants act as a protective barrier for cavity-prone areas, like the back molars. By applying the plastic coating to their teeth, it significantly reduces the risk of tooth decay. It is best to have them applied around the age of 6, but it is never too late to benefit from their protection. Fluoride is known as “nature’s cavity fighter.” By applying a fluoride varnish to their teeth, it keeps their enamel strong while also replenishing areas where it has weakened. This helps the teeth remain resistant to decay. In between your child’s dental appointments, there are several things you can do at home to nurture your child’s developing smile. Brush twice a day using a soft-bristled toothbrush and a fluoride toothpaste. Floss between each tooth before going to bed. Limit sugary treats and drinks. What to expect at different ages? When your child is around the age of 1, we mainly use the preventive appointments as an opportunity to earn your child’s trust. We count their teeth and perform a quick examination. As your child ages, their visits become more comprehensive to include a cleaning, full checkup, and x-rays. Give your child the foundation they deserve for a healthy smile with regular preventive appointments. Contact our office today to schedule their next cleaning and checkup.